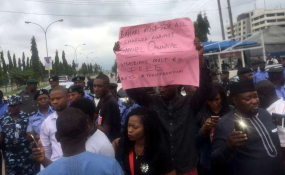 The OurMumuDonDo Movement wednesday said it would protest against the arbitrary arrest of Premium Times journalist, Samuel Ogundipe, today if the Nigerian Police fail to release him from their custody. The Nigeria Union of Journalists (NUJ), international rights group, Amnesty International (AI), the International Press Centre (IPC) and Media Rights Agenda (MRA) yesterday demanded the immediate release of Ogundipe. Ogundipe was arrested by the Police after he declined to disclose the source and identity of person(s) purported to have leaked the report by the Inspector General of Police (IG), Ibrahim Idris, to acting President Yemi Osinbajo on the invasion of the National Assembly by personnel of the Department of State Service (DSS) spearheaded by the sacked Director General, Lawal Daura. Concerned Nigerians have mount pressure on the Police to release Ogundipe, arguing that under the Nigerian law, journalists are not obligated to divulge their journalistic source except in exceptional cases based on circumstantial grounds and supported by law. But in a statement signed by Charles Oputa, OurMumuDonDo Movement; Adeyanju Adedeji Concerned Nigerians; Ariyo-Dare Atoye, Coalition in Defense of Nigerian Democracy and Moses Paul of Mad Connectt, the groups maintained that the arrest of Ogundipe, to say the least, amounts to abuse of Nigeria’s constitution with regards to freedom of speech and freedom of the press. They said the group “wishes to express its outright disapproval of the current onslaught on press freedom in Nigeria by the Nigerian Police Force. “We are extremely concerned that the IG, Ibrahim Idris, would openly flout the law of the land by unlawfully detaining Mr. Samuel Ogundipe of Premium Times Newspaper for refusing to disclose the source of his story. “This arrest is an open affront on chapter IV, S. 39 (1) of CFRN 1999 as amended, which guarantees the freedom of expression of Nigerian citizens and the freedom of the press in Nigeria. In separate petitions to the Acting President, Prof Yemi Osinbajo and Inspector-General of Police, the other groups also demanded that Ogundipe’s personal bank account be unfrozen by the police. The NUJ’s August 15 letter signed by its National President, Mr. Abdulwaheed Odusile, accused the IG of hounding the press and urged the Acting President to call him to order. The NUJ recalled the abduction and detention of two journalists who are brothers, Daniel and Izuchukwu Elomba as well as the abduction of the National Assembly correspondent of Daily Trust, Abdulahi Krishi, by the Special Anti-Robbery Squad (SARS). It added: “It is obvious that the excesses of the IGP against the media is giving your government a bad image as an anti- press government, even when it’s obvious these infractions were carried out without The Presidency’s imprimatur. Amnesty International tasked the police to “immediately and unconditionally release journalist Samuel Ogundipe, who has been in unlawful police detention since yesterday (Tuesday). In its statement, the IPC said it was “particularly dismayed that the Police authorities want Mr. Ogundipe to disclose the source of information over a story published by the newspaper on a correspondence between the Inspector-General of Police and the Vice President. IPC reminded the Police that Section 16(C) of the Freedom of Information Act, “confers on journalists the media ‘Journalism Confidentiality Privileges’ and as such” the police should desist from unconstitutional acts. Similarly, Media Rights Agenda (MRA) dismayed by the “increasing resort to tactics of intimidation and harassment” of media practitioners in breach of the Constitution and other laws.